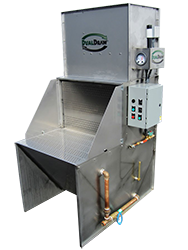 DualDraw Wet Collectors (the WC Series) are filtration systems designed to capture dust from processes such as grinding, deburring, cutting, polishing, mixing, and many others. 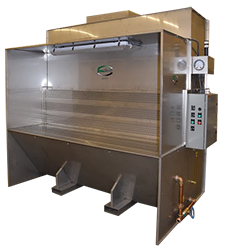 These are available as stand-alone scrubbers, walk-in clean air stations, or as wet downdraft tables. Our industrial wet dust collectors are typically used to address highly flammable or combustible dusts such as aluminum, titanium, and magnesium. While these are some of the more common and dangerous metal combustible dusts that these solutions can help safely contain, there is a broad range of other combustible materials that can be mitigated using these solutions. In addition to combustible dust containment, Wet Collectors are used to decrease fire risk from processes that may produce hot sparks or slag that would otherwise ignite dry filter media. DualDraw is the only industrial air pollution control company to have a published efficiency test of its specific wet collector design. 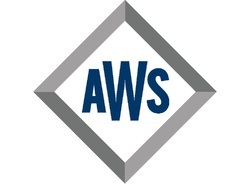 Results are readily available for review and we encourage customers to evaluate these when making a purchasing decision about what system is going most effectively address their application. Ask us today for the report. Our “WC” series uses water as its filter – especially critical in applications that produce combustible dust. Our wet dust collector design scrubs the air of the combustible dust and safely returns the air back into the facility – we have had independent testing to prove our collector’s design efficiency. With these wet dust collectors, customers also have the option of venting outdoors if desired. When our scrubber design is combined with the “BG” Style of downdraft tables and backdraft air flow, operators have an industrial dust collection system that efficiently collects hazards while providing application versatility. 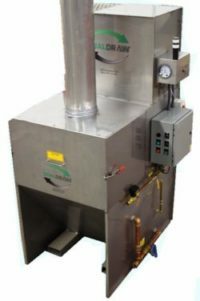 The “SAF-WS” series can be ducted to one or multiple pick-up points – these scrubbers are an excellent choice when fixed hoods, enclosures, or machines exist where the application is producing combustible dust. DualDraw engineers configure the wet dust collectors with the proper fan to maintain NFPA required duct velocities for the transportation of combustible dust. Our wet dust collection system design has been efficiency tested by an independent party is backed by a multi-year warranty on parts and labor – we are the only vendor with these kind of credentials on our wet scrubber systems. Water filtration in DualDraw collectors is primarily used to capture hazardous combustible dust. 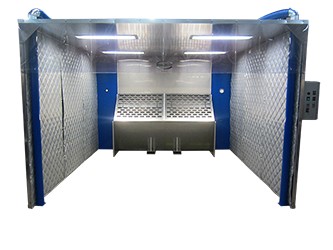 When combined with the downdraft booth “TB” style, this solution offers maximum containment for operators. The three sided enclosure of the wet dust collection system, plus the top with light, provide a well-lit protective hooded area to perform the most hazardous applications needing maximum protection. 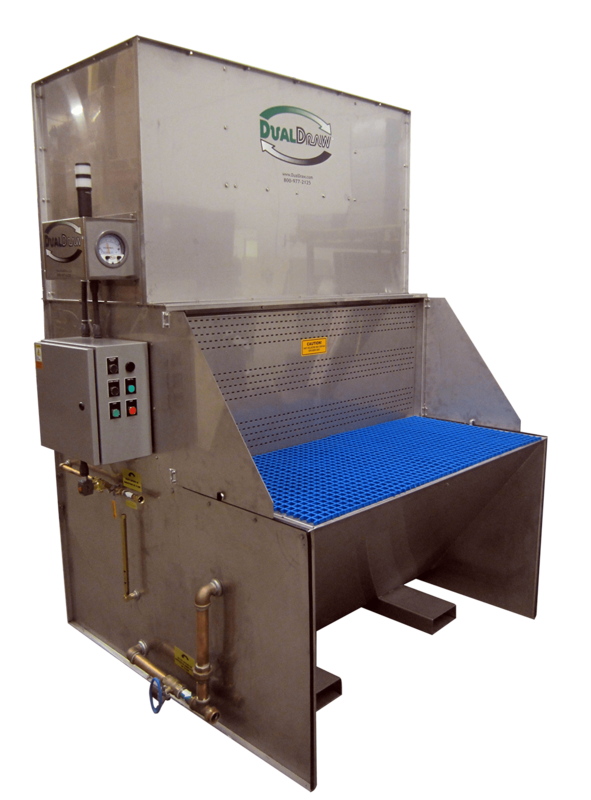 DualDraw Wet Downdraft Booths and Wet Scrubbers come standard with the required componentry to comply with current NFPA 484 regulations. Wet Walk-In units are an all-in-one heavy-duty solution for combustible dust collection. These wet dust collectors enclose the most challenging applications to ensure efficient collection of hazards. Wet scrubbers are aligned on the back wall of the booth to generate required air flow to move and then capture the combustible dust particles. Our design of wet dust collection systems is battle tested – it has been independently verified for collection efficiency by a third-party industrial hygiene company in collaboration with a state university. DualDraw is the only vendor in the market that has an independent efficiency test specific to our industrial dust collection system design. More information on DualDraw’s wet dust collectors?